Product prices and availability are accurate as of 2019-04-17 14:10:06 UTC and are subject to change. Any price and availability information displayed on http://www.amazon.com/ at the time of purchase will apply to the purchase of this product. The Amprobe AM-160-A digital multimeter with included temperature probe is a true RMS (root mean square), auto- or manual-ranging meter for measuring current, voltage, resistance, capacitance, frequency, duty cycles, milliamp loop current, and power in decibels relative to miliwatts (dBm) in electrical testing applications. 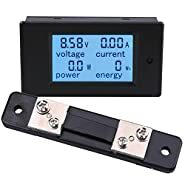 The meter comes with a set of detachable test leads that measure alternating current (AC) and direct current (DC) to 10 amp, AC voltage and DC voltage to 1,000 volts (V), resistance to 50 megaohms, capacitance to 10,000 microfarads, line-level frequency to 200 kilohertz (kHz), logic-level frequency to 2 megahertz (MHz), duty cycles to 99%, 4- to 20-milliamp DC loop current, and power to 54.25 decibels relative to miliwatts (dBm). The meter comes with a K-type thermocouple probe for measuring temperature. 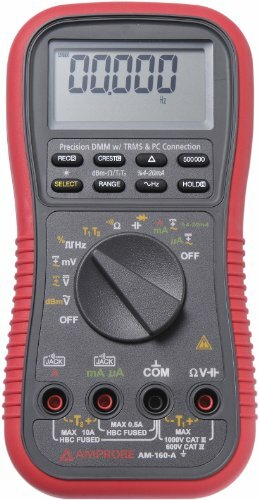 The AM-160-A TRMS digital multimeter has a port for connecting the meter to a computer (software and cable not included). The instantaneous peak hold function records peak positive or negative AC or DC current or voltage measurements lasting for as little as 0.8 milliseconds in duration. The maximum or minimum reading mode displays the highest or lowest reading in a session to track a sudden increase or decrease in readings. A liquid crystal display (LCD) shows readings both in digits and on a 42-segment bar graph. The display is backlit for visibility in low light. The relative zero mode stores a reading in memory to use as a zero point for subsequent readings, allowing for quick comparison of readings. An audible continuity sensor confirms that the circuit conducts electricity, and a diode test detects whether the circuit's diodes work properly. The hold function keeps a reading on the display, even after the meter is disconnected. An auto power-off mode turns off the unit after 17 minutes of non-use to conserve battery life, and a low-battery indicator signals when the meter's batteries need to be replaced. This true RMS (root mean square) sensing meter provides accurate readings when measuring linear loads, such as standard induction motors and incandescent lights, where the current or voltage has a sinusoidal waveform, or non-linear loads, such as electronic devices or motors, where the current or voltage has a sinusoidal non-sinusoidal waveform. Two ranging modes (auto or manual) offer a range of operator control when taking readings. When turned on, the meter is in auto-ranging mode and automatically selects the correct operating range for the property being measured. It can be switched to manual-ranging mode, which allows the operator to choose the appropriate operating range. The meter has a 500,000-count resolution, meaning it can display up to 499,999 units (5-4/5 digits) before the operating range needs to be changed. For DC voltage, the operator can choose between a 50,000-count (4-4/5 digit) resolution for quicker measurements, and a 500,000-count (5-4/5 digit) resolution for more stable readings. For frequency readings, the operator can choose between a 50,000-count (4-4/5 digit) resolution for quicker measurements, and a 1,000,000-count (6-digit) high-resolution mode for more stable readings. 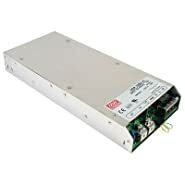 It meets International Electrotechnical Commission (IEC) safety standard 61010 and is certified for category III installations up to 1,000V, which covers items used with enclosed building circuit installations (such as service panel parts, branch circuits, and fixed installations that are connected directly to a building's AC power supply), and category IV installations up to 600V, which covers measurements at the source of the low-voltage supply, such as electricity meters and overcurrent protection devices. H is height, the vertical distance from the lowest to highest point; W is width, the horizontal distance from left to right; D is depth, the horizontal distance from front to back. 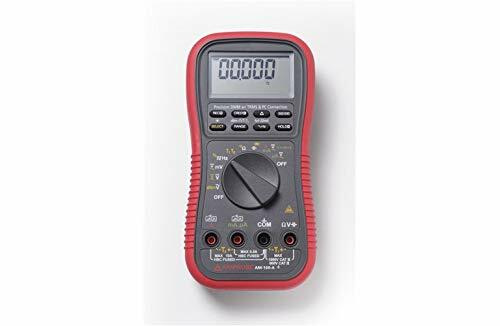 Multimeters are electrical test meters that measure multiple properties of an electrical circuit, such as current, voltage, resistance, capacitance, and continuity. 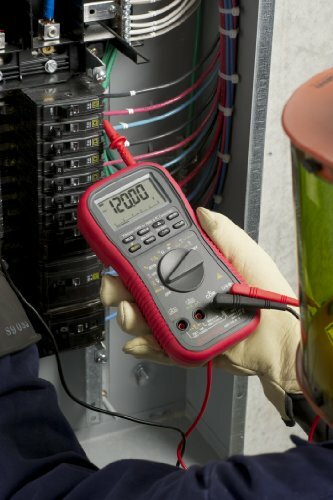 Available in handheld or benchtop models, multimeters diagnose electrical problems in electrical equipment, wiring, and power supplies. A variety of probes, clamps, and leads can be used to connect the meter to a circuit or device. Multimeters display information either in analog or digital form. Factors that influence meter choice include the electrical properties to be measured, the anticipated range of results, and the desired level of protection against transient voltages. Safety ratings are based on the International Electrotechnical Commission's (IEC) standards for low-voltage test equipment. IEC 61010 delineates four overvoltage installation categories. In general, a meter with a category IV rating will provide more protection against transient voltages than a meter with a lower category rating. 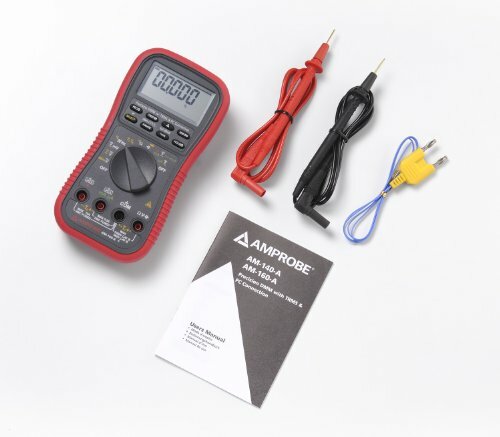 Amprobe manufactures electrical testing equipment for commercial, industrial, and home use. The company was founded in 1948 and is headquartered in Everett, WA.